Work management is the art of matching what customers need with the best available resources to meet that need. Institutional vision, leadership, judgment, organizational structure, policies, and processes guide the endeavor toward a goal. In the business of educational facilities management, the goal is the wise use of resources in providing the optimum physical environment for instruction, research, and public service. This APPA Body of Knowledge section looks at the information, services, and programs associated with work management. A fundamental work management task is the ability to convert a customer's concept into the essential data that defines an achievable task. Customer is a broad term in an educational setting. Work requests come from students, faculty, staff, police and security personnel, library patrons, visitors, governing bodies, or building automation systems. All are facilities management customers. The work management group needs someone, typically service desk staff, to interact with a customer, gather essential data, and authorize and assign the work. Their job may be straightforward when they receive a request such as "Please replace the light that is out in room 202," or it may begin an iterative process that compiles broad and deep specific information for a request such as "Please design and build a hospital." Someone in each organization must be responsible for collecting and updating this data and assigning a unique identifier. The identifier may be a project ID or work order number or task order, but it must be easily distinguishable from other work assignments. Each work order contains essential data elements, and the service desk, or its equivalent in your organization, gathers this information. Work order number: A work order number uniquely identifies a particular job. This simple device often serves a vital role as a database table's primary key. Emergency: The phone rings. The service desk answers. The caller reports there is water pouring out of the ceiling onto their servers. An emergency work order is a response to an immediate or imminent threat to people or property. Well-trained work management staff focuses on the information needed for an immediate response then follows up to collect other important data elements. Everyone responding to an emergency work order benefits from clear, concise information. Communicating promptly and directly and flagging the work order as an emergency makes that easier. A field that flags emergency work orders is particularly useful for organizations that track emergency response as a key performance indicator or certification criterion. Requester: Several people are typically involved in a work request. The work may benefit a faculty member but an account manager and department administrator may also be involved. Among the interested parties is the primary point-of-contact. Home in on this individual and record the person's name, phone number, e-mail address, and department. Treating this central customer as the requester will likely speed overall communication during the work effort. Get to know requesters and build working relationships with them. Communication improves with someone you know and understand. Location: The building or grounds area identification is critical business data for nearly all facilities management organizations. The Postsecondary Education Facilities Inventory and Classification Manual (2006) is a widely accepted standard for defining and classifying educational spaces. Ideally, you are already using this or a similarly well-thought-out data structure for locations. If not, make a plan that implements this data discipline. Building number often serves as a primary key and thus a critical database field. It is not unusual for a geographic information system to take this a step further and physically locate equipment in an exact spot on the earth. Scope: What is it that needs to be done? Capture as much relevant information as possible including requester feedback expectations. It may require several iterations to investigate, design, and execute what is needed. Recording notes at key decision points helps the work team quickly grasp the history and direction of the task at hand. Status: The status clarifies the current state of a work order and allows controls to be put in place to satisfy business practices. For example, if the work order status is "Waiting Scheduling," a business practice can be set to reject labor charges against the work order. Most work order systems provide a record of who changed a work order status and when the change occurred. Fund provider and funding identifier: Cost-reimbursable facilities management organizations bill for the work they perform. Charges are typically collected by work order. Some organizations bill as charges are recorded; others set a cyclical billing cycle. The work management group helps those sending the bill determine exactly which account is paying for the work and the nature of the financial agreement. Conventional financial agreements include fixed price, guaranteed maximum price, or time and materials cost reimbursement. In some cases, multiple fund sources are involved. When this occurs, the work management group helps discern if each account is paying a fixed amount or if the accounts are sharing a percentage of the cost. Defining these details early tends to make everyone's job easier. Even if your facility organization is not cost recoverable, funding discernments remain and are best understood early in the process. Budget: Every work order has a budget expectation. Service desk staff needs the training and experience to determine if the budget expectation is understood as part of a normal business practice, or if a more specific budget limitation constrains the work order. Schedule: Once a requester defines a scope and believes it to be affordable, the next question is "How soon can the work be done?" The customer may have a particular date in mind or need the work done during an upcoming window of opportunity. The service desk documents the desired schedule and helps frame the customer's expectation about when something will occur, but often does not set the specific schedule for the groups doing the work. These are the most basic data elements. After they are collected, the process of authorizing and assigning the work begins. Authorizing a work order requires understanding and seeking necessary permissions. Permissions are frequently tied to financial expenditure levels, but may also be linked to criteria such as institutional priority, consequence of not doing the work, location, or nature of the work. The fewer the permissions required, the more efficient the work order process. It makes sense to empower service desk staff to commit resources to emergency or corrective maintenance work. A computerized maintenance management system may be authorized to release waves of preventive maintenance work orders. A customer, on the other hand, may need to see a fixed price proposal before committing to proceed with a project. Work management staff recognizes the authorization variables and collaborates with others in the facilities organization to acquire the necessary concurrences. Assigning a work order empowers a work group to proceed as far as the currently available permissions allow. The objective in assigning work is to match the need to the available resources that can best meet that need. An efficient work assignment process allows the service desk person that receives a request to make the assignment directly to an individual. This requires trust, communication, and cooperation between supervisors and work management staff. In cases where direct work assignment is inappropriate, then service desk staff assigns someone, such as a work group supervisor or scheduler, the task of assigning the work. Who assigns the work and to whom it is assigned is largely a function of organization structure. A trade-based, or central shop, organization structure has the plumbers reporting to one supervisor, the electricians to another, and the HVAC mechanics to another. The trade staff is then dispatched to jobs in any facility from the central pool of resources. A zone-based organization assigns a mixture of trade expertise to care for a specific set of buildings. A function-based organization is structured around the type of work. One work group performs the preventive maintenance, while another group responds to service calls. Many facilities organizations blend these structures as the institution grows and changes. Large institutions can take advantage of a particularly nice hybrid that arranges the most frequently needed trades into work zones; the more exotic trades, such as roofers, elevator mechanics, and fire system technicians, into central shops; and those responsible for renovations into a major projects group. An effective service desk understands the facilities management organization structure, is aware of workloads and customer preferences for the available resources, and assigns the task to a particular work group or individual. The assignment is recorded in the work order information system and clearly communicated to the responsible work group or individual. When work orders involve multiple work groups, then an individual is designated to coordinate the group efforts. Every work order needs essential data describing who, what, when, and where. Work orders also need to capture information that meets the needs of business processes. The processes are as variable as facilities organizations. Here are several data elements worth including in the work order database. Work order creation date, time, and created-by stamps: Ideally, the work order system will record this information automatically. At a minimum, the system also needs to capture who last updated the work order and when. A log of what was actually changed, by whom, and when is even better. Work type: This is a way to categorize the nature of a work request. It is helpful to think about large categories such as preventive maintenance, repair requests, and minor versus major elective work. Each major work type can then be subcategorized in a way that helps people find and sort work orders. For example, work type can be used to find all the preventive maintenance work orders for a particular building and then sort the work orders into code-required versus routine preventive maintenance. Primary trade: Some facility maintenance organizations work out of central shops that are grouped by primary trade. Some work out of maintenance zones. Yet others are a hybrid of central shops and zones. In a central shop organization, one can determine the primary trade by knowing which shop did the work. In a zone maintenance organization, one needs to note the primary trade as a separate work order field. This aids in the assignment of work and in resource planning. Permits: Work orders may need legally required permits before work begins. Significant renovations may require a building permit. Replacing a water line may require a digging permit. The service desk staff can often use the work order location and scope to predict the required permits. Where that is possible, it makes sense to record the permits needed in the work order system or in a permit tracking system that is linked to the work order system via the work order number. Notifications: While a permit implies a legal obligation, there are plenty of other reviews and approvals that make business sense. An outage notification lets researchers know when the chilled water to their building is going to be turned off. An architectural review board helps provide campus cohesiveness. The sooner the need for a particular notification is recognized and recorded, the better. Some work order systems support these business processes, and in other cases a complementary business application links the notifications to the work order via the work order number. Parent-child relationships: Work orders may stand on their own, or be part of a larger effort. When there are parent-child work order relationships, capture this in the work order system so that a whole picture of the larger project is created. 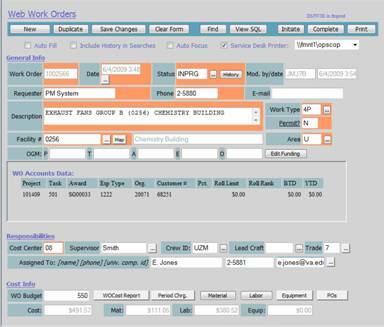 Priority: It is possible for the combination of several work order fields to establish a work order's priority. An emergency service call to restore power to a research building is likely to take precedence over replacing a burned-out light bulb in a well-lit room. When the priority is not obvious, the priority field clarifies the situation. Keep the priority system simple. The old-fashioned A, B, and C priorities still work well. 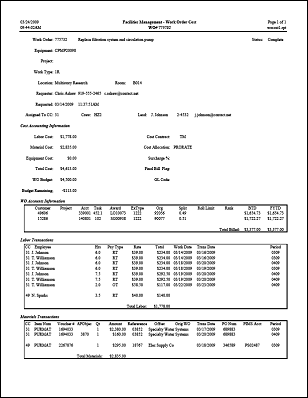 Expense: The time, material, equipment, and other costs of a work order need to be tracked. The more detail available, the better. This allows for proper billing of the work, for answering questions about who worked on a job and when work was done, and for filling out the Annual APPA Facility Performance Indicators Survey. Occasionally a customer needs something and is so well funded that cost is not a constraint. You just do it. Most of the time, customers need to know how much something is going to cost before authorizing work to proceed. Work management collaborates with other facilities resources and the customer to provide cost information. Two related parts of the cost issue are the type of pricing agreement the fund provider prefers and the kind of estimate needed to arrive at the pricing. There are a variety of pricing agreements. Time and material agreements charge a customer a predetermined hourly rate for labor plus the cost of material and equipment needed for a job. Time and material pricing works when all parties are in agreement about the scope and order-of-magnitude, when significant cost swings are unlikely, and when the time it takes to prepare a detailed estimate is better spent completing the work. The fund provider bears the risk of budget overruns in this arrangement. Fixed price agreements are useful when there is a hard limit on the funds available. Arriving at a fixed price tends to require a well-defined scope and detailed cost estimate. The service provider bears the risk of cost overruns in this arrangement. Guaranteed maximum price agreements set an upper limit on the cost to the fund provider, but allow for a lower cost when a project goes well. This is a good pricing option when the fund provider and service provider collaborate to minimize the project cost and share the risk of cost overruns. In some cases, a guaranteed maximum price agreement offers a shared "savings" between the fund provider and service provider when the actual cost is under the maximum price. Unit rate agreements define a value for a unit of work such as the cost of excavating a cubic yard of rock or installing a foot of six-inch water main. Unit rate agreements may be used in conjunction with other pricing arrangements as a way of addressing unknown conditions. Combining an extensive list of unit rates into a unit price book creates a job order contracting environment. The effort to price frequently used services can shorten the time it takes to estimate work and move it into the execution phase. The amount of information available influences the type of cost estimate. When detailed information is available, a cost estimate can be prepared by adding up the cost of the materials, labor, equipment, and other project expenses. Companies that specialize in cost estimating are glad to assist with this effort. Resources such as RSMeans allow knowledgeable facility staff to prepare detailed cost estimates themselves. When detailed information is not available, looking at the project's scale, in square feet perhaps, and applying a cost factor per square foot provides an order-of-magnitude cost estimate. The cost factor may be based on the historical cost of similar projects at the institution or again on resources such as RSMeans. An estimator needs facilities management experience, knowledge of the work site and institution, and judgment about the impact of project constraints to prepare a useful cost estimate. Master production schedules are common in a manufacturing environment. Master schedulers understand which goods and services are provided by each work unit, the unit's backlog of work, contracted resources available to supplement in-house resources, material lead times, and equipment availability. This allows a master scheduler to project overall product availability. The work management group or several groups working together perform the master scheduling function in the facilities environment. Work management uses its master schedule and organizational knowledge to assign work to a specific work group. Work management then collaborates with the work units and the customer to firm up a delivery schedule. Continuing the manufacturing comparison, many facilities management's products are make-to-order. That is to say, the deliverables require investigation, planning, and estimation in response to a custom effort. However, a surprising number of facilities management services are repetitive and predictable, work that manufacturers think of as make-to-stock. Custodial service, grounds care, and preventive maintenance are largely recurring activities. Work management looks for ways to shift work from the unplanned to the planned realm, from the unexpected to the routine. This gives work units the opportunity to be more efficient and more responsive should a true emergency arise. Planned work allows completion expectations to be established in advance and more consistently reflects organizational priorities than unplanned work does. For example, work management may expect preventive maintenance (PM) work orders to be completed within one month of authorizing the work to begin. If the PM frequency is less than a month, the expected completion may be several workdays after authorization of work. Unplanned work may also have pre-established response times. An emergency service call typically requires immediate response even if it means calling in off-duty staff. Set expectations and communicate them to customers. Managing expectations helps reduce surprises, so where possible, commit the facility organization to a defined response time and then meet your commitments. The Association for Operations Management (APICS) offers numerous resources if you wish to ponder scheduling in greater depth. John H. Blackstone's Capacity Management (2002) is a popular reference. Ultimately, a specific person performs specific tasks to complete a work order. Front-line supervisors often make, or have significant influence over, the decision of who on their staff does what on a given day. Individual work assignments may occur throughout the workday as assignments flow into a work group, or work orders may be accumulated and allocated on a daily or weekly basis. The accurate information collected by work management staff enhances the ability of facilities management and its customers to accurately study the past and make informed plans for the future. Work control is the routine and ad hoc effort to plan, measure, follow up, and report on work. The planning effort reviews the backlog of work, resource availability, and considerations such as the institutional calendar. It uses this information to guide work assignments and estimate work completion dates. Work control can measure performance at many levels. For a particular project, it may be important to track actual cost. Work control may mean measuring the percentage of preventive maintenance work orders completed by the due date, actual preventive maintenance work hours versus estimated work hours, or the time it takes to complete an emergency work order. Major projects may merit a summary report that describes percentage of scope complete, planned versus actual cost, planned versus actual schedule, and issues facing the project team. The idea is to capture this information in the work management system and thus make it available for routine and ad hoc queries and reports. Like electrons to a nucleus, work management has certain business functions that tend to associate with it. Customer service and maintenance program management are frequent examples. It is important to make facilities management decisions in light of an institution's overall purpose. The University of California, Berkeley mission statement begins, "The University's fundamental missions are teaching, research and public service". The themes of teaching, research, and public service appear in many educational mission statements. Work management contributes best when it provides customer service and maintenance program management with the institution's mission clearly in mind. An institution's appearance is an important factor in attracting students, faculty, and staff. The people who decide how well the grounds are tended or which buildings get painted make important decisions for the school. The way facilities management interacts with its clientele, and for that matter the entire institutional community, makes the work ahead easier or harder. Customer communications and proactive customer relations are key to making a positive first impression. Facilities management projects its persona into the institutional community in many ways. The way people interact with people makes a lasting impression. Training and reminding facilities management staff to listen well and treat everyone with respect remain worth the time and effort. Study the electronic image that the facilities management organization presents. Strive to make it customer focused and aligned with the institution's mission and objectives. Look for ways to manage customer expectations and to meet their needs with minimum effort on their part. The job of answering customer phone calls and responding to online service requests and e-mails typically falls to the customer service group. This group may not be the face of facilities management, but they are its voice. The tone of voice, competence, efficiency, and dependability projected by the customer service group are important impressions of facilities management. When a customer needs help, a customer service person needs to be available and set the help in motion. When not assisting a customer, the service desk is busy with other duties, but these duties must be able to be paused when a customer needs assistance. Avoid the temptation to overtask the customer service group in an effort to maximize productivity. Productivity is good. Being available to customers is best. The customer service desk is available to react to customer needs. A proactive customer relations program initiates and nurtures customer interaction. This is particularly valuable once an institution's size begins to disconnect building occupants from facilities management staff. There are a number of ways for facilities management to connect with the school community. Customer Relations Manager : This is a full-time facilities management employee who seeks out key departmental contacts and visits them on a regular basis. Preparation for the visit includes reviewing departmental work orders from the customer's perspective. Are there recurring issues about which the customer will want an update? Are there projects planned in their vicinity that may impact departmental activities? Is there another way to meet their facility needs that might save the school money? Looking at facilities management information from the customer's perspective and then sharing that perspective with the customer builds rapport and trust. This relationship pays dividends for the customer and facilities management when occupants face facility challenges such as an area renovation or a ruptured cooling coil. The customer relations manager facilitates communication and coordination and gives customers an advocate within what is often one of the larger university departments. Facility Coordinators : A facility coordinator program identifies the departmental representative who repeatedly interacts with facilities management. If these key contacts are willing to be recognized as facility coordinators, they can accelerate outage notifications and other facility-related communications. They also help facilities management staff understand a department's needs. It is important for facility coordinators and other departmental leaders to see the role as a benefit to the department and not one more administrative task they must complete. Listen to facility coordinators' concerns, welcome them when they call or visit the facilities management offices, and keep them posted about upcoming projects in their vicinity. Building this relationship pays dividends for the department and the facilities team. Some institutions are small enough that everyone knows everyone else. Other institutions are communities of a hundred thousand people collaborating from locations around the globe. Both situations need a facility-focused communications list. Who will be called if a building is shut down due to a hazardous material spill? Who needs to know about a planned electrical outage? If you have a facility coordinator network, the communication task is easier because the coordinators are likely to know about new faculty and staff who merit contact or the critical equipment that was recently installed. Communication occurs with or without a facility coordinator, but without one it may take longer to reach essential personnel. Facilities Management Advisory Board : Advisory boards are a way for people with a common interest, in this case facilities management, to meet and exchange perspectives on important issues. Board members may be appointed by the school's top executives or may be invited to participate by the chief facilities officer. Surveys :Soliciting and acting on customer feedback is another way to enhance positive relationships. Surveys are one method of harvesting customer input. The challenge is getting a useful number of responses. You can improve the response rate by keeping the survey short and relevant. A four-question survey that arrives with a work order completion notice is much more likely to be answered than an unsolicited survey with 40 questions plus comment fields. When a customer responds, do something with it. When results include compliments, pass them on to the staff who provided the service. This informs facilities management staff that their efforts are appreciated and puts the customer in a favorable light. When the survey includes a complaint, investigate, then call the customer back and share what was learned. You may not be able to correct a previous misstep, but you can reduce the chance of a recurrence. You also show your customer that you listened. Maintenance and operations program managers participate in two unending pursuits. One is securing an appropriate level of resources. The other is deciding how to use the resources to the institution's maximum benefit. Think about every facet of operating and maintaining facilities. Someone has made a case for the people and budget to provide a particular service. Once the budget is set, someone decides how often to change the air filters, how frequently to empty the trash cans, and when to replace the roof. Each resource illuminates the technical and operational details specific to the discipline. This includes defining levels of care and offering staffing metrics associated with each level of care. Program management is the overall approach of applying the details to your school's situation. The following section focuses on applying program management principles to maintenance activities while keeping in mind that grounds care and custodial services deserve the same consideration. Jay Klingel, long-time dean of the APPA Institute for Facilities Management's Maintenance and Operation track, defines maintenance management as "A systematic approach to the maintenance and upkeep of facilities, grounds and infrastructure, in support of the institutional mission, applying such management principles as organization, planning, measurement, and control". The systematic approach to secure appropriate funding begins before a new facility is even conceived. It begins with facility professionals helping the educational community understand the financial realities of owning buildings, land, and infrastructure. The book Buildings The Gifts That Keep on Taking makes serious points, beginning with its title. One maintenance funding approach calls for new facility fundraising to include a maintenance endowment equal to the building's construction cost. This sounds like a lot, but look at the math. If an endowment earns an average of 6 percent, then about half the income goes to keep up with inflation and the other half is used to pay for maintenance. Incremental funding is needed for utilities, custodial services, and ongoing adaptation expenses. This is in no way intended to discourage the construction or purchase of a building. Rather, it is intended to ensure its long-term viability. Based on experience and judgment, the committee proposes that the appropriate level of M&R spending should be, on average, in the range of 2 to 4 percent of current replacement value of the inventory. The specific percentage for any inventory will depend on such factors as the age of the buildings in the inventory, the type of construction (permanent vs. temporary), the level of use of the buildings, the structure of the maintenance organization, and the climate. Long-time APPA contributor Harvey Kaiser has written for three decades about deferred maintenance and importance of ongoing maintenance and repair. His works address the topics in detail and are exceptional resources when preparing a presentation for incremental funding. Several are available from the APPA Bookstore. The National Research Council committee goes on to state that the 2 to 4 percent expenditure level is appropriate for buildings that do not have a maintenance backlog. The maintenance backlog is the estimated cost of maintenance and repair needed to return building systems to their original design performance. A facility's maintenance backlog divided by its current replacement value gives a practical measure of building condition known as the FCI. An FCI under 5 percent indicates a building with few maintenance needs and serving its intended purpose well. A 5 to 10 percent FCI indicates a building that has occasional issues, but the occupant impact is typically acceptable. A FCI over 10 percent signals a building with recurring problems in one or more systems and noticeable impact on the occupants. A building with a fresh coat of paint and new carpet may still have an 18 percent FCI. The trained observer sees beyond the first impression to the roof and other hidden, but vital, systems. The MRR and FCI are simple and enlightening maintenance metrics. But it is important to stop and ponder their common denominator, the current replacement value (CRV). Increasing the CRV makes the FCI "better" and the MRR "worse". Take care in initially selecting the CRV and in choosing a method to adjust its value for inflation. Select a methodology that you can stick with for many years. If you must change the basis for the CRV, then go to extra lengths to communicate the reason for the change and its impact on the metrics. A reasonable, definable starting point for the CRV is a facility's actual construction cost. Construction cost excludes project costs that do not create a building maintenance obligation such as the cost of land, architectural fees, and project management fees. Once an initial CRV is determined, it needs to be updated in a reliable way. The Engineering News Record's Building Cost Index and RSMeans' Construction Cost Index track facility-related inflation and are excellent references in the process of updating facility values. Consider the math for another moment. It is common to update both the FCI's numerator and denominator with the same inflation index. This leaves the inflation-adjusted FCI unchanged. Not so for the MRR. Inflation increases the CRV in the denominator, but the maintenance budget is not necessarily increased for inflation, and may be reduced by other budget forces. Inflation in the denominator without a corresponding increase in the numerator makes the MRR suffer. It is a true revenue challenge just to keep inflation from eroding the maintenance budget. The work management team needs to help institutional budget staff understand and positively confront this reality. Should you find yourself making a presentation about maintenance funding needs, recognize that you are competing for precious resources. Seek to understand your audience and speak their language. Recognize there are competing priorities. Tell a convincing story. Once a reasonable level of maintenance funding is secured, maintenance program managers decide how to spend it. Bear in mind that each organization assigns the duties of maintenance program management to one or more staff roles. While the people making spending decisions may work in different parts of facilities management, they must collaborate to perform at a high level. Consciously making them part of the same work group, with integrated goals, encourages the collaboration. Finalizing and sharing the plan occurs at general and specific levels. A maintenance budget overviews the financial resource allocation. Specific expectations and frequencies may be recorded in multiple locations such as the preventive maintenance system job plans and frequencies, or in service-level commitments published on the facilities management website. Both the general and specific maintenance plans need to be available to the institutional community. 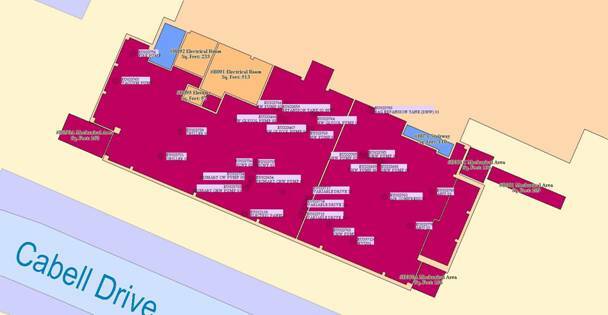 The plans document facilities management's commitment to the community and provide a useful measurement reference. The report below shows how these decisions played out over several years for one facility. This is an overview of one building's maintenance and operating expenses. Grounds care, custodial, utility, and maintenance costs are displayed over time. The building is in excellent condition thanks to a thorough capital renovation followed by appropriate operation and maintenance attention. Maintenance resources may be allocated in many ways. Each of the programs highlighted below deserves to be in the mix. The program manager blends the mixture to align with institutional priorities and the long-term health of the facility portfolio. It is less common for organizations to track the same information for each infrastructure system. Ideally, the facility inventory information includes the infrastructure data and allows program managers to consider all of an institution's needs in the expenditure prioritization process. The best assessment is a full condition assessment. This includes a sensory inspection of every room in a facility or part of an infrastructure system, a review of all building systems, interviews with occupants and maintenance staff to learn about a facility's performance, and a review of drawings, past inspections, and reports that shed light on a facility's condition. The full condition assessment results in a detailed, prioritized, categorized list of deficiencies. Ideally, the inspectors are empowered to submit basic service calls as those deficiencies are identified and the maintenance program manager responsible for the building visits the site to review every deficiency. After the site visit, a planned action is recorded for each deficiency, even if the action is to add the deficiency to the maintenance backlog. The full condition assessment costs more than other types of inspections, but the prioritized, specific project information is worth the expense. A life-cycle analysis is a less expensive alternative to a full condition assessment. The life-cycle analysis is a probability-based condition assessment. The analysis includes a site visit to determine the quantity and kind of building system in a facility, such as a pitched roof with slate shingles verses a flat roof with fully adhered membrane. The inspector estimates the remaining useful life in each building system. A software application calculates the building condition based on life cycle probabilities and applies a unit rate to estimate cost. The life cycle analysis approach is useful when a general sense of backlog value and possible problem areas is needed quickly. The shortcoming of this approach is the lack of specificity about deficiencies and uncertainty if a need is real or calculated. A variety of contractors offer full condition and life-cycle assessment services and the related database and software applications. Institutions can contract for a cyclical inspection effort; train and utilize their own staff and information systems; or blend both resources to meet their needs. A four- or five-year inspection frequency is commonplace. It is crucial to update the data between inspection cycles so that it indicates both corrected deficiencies and those identified between inspections. Just as an active building requires endless maintenance, so too does an active database. Table 2. Sample entries from a facility condition report. 17124 Room 100 Wall deflection in the Commons Room. 2 $394,125 The pronounced inward deflection of the north wall of the Commons Room has been a concern for at least ten years. The bow is highly visible from the exterior as well as the interior. Movement of the wall is being monitored on a monthly basis with a very basic method of suspending a plumb bob from two points about eight feet apart on the wall and hitting a mark on the floor. No noticeable movement has been detected since this method was implemented several years ago. E-mails from a staff structural engineer indicate that movement of as little as a ½ inch would be a concern for the integrity of the wall. 16352 2nd Level Repair windows 1 $127,697 The tall casement windows that line the second-floor walls are in poor condition. Though they are much admired by office occupants, the drafts and poor security provided by these windows are a major concern. Many of these windows are painted shut and haven't been opened in years; others can't be closed. One office props a large stone against the sash to keep the window closed. The facility condition database is a practical location to record nonmaintenance building needs. The University of Michigan's Facility Condition Assessment program offers an example. Adding a few data fields allows the documentation of improvements that enhance accessibility, building code compliance, and/or adaptation to changing occupant needs. Include a data field that distinguishes maintenance needs from desirable improvements. Only include the maintenance needs when calculating the FCI. If (and this is a big if) your data captures every appropriate improvement, then dividing all the needs by the CRV yields a renewal requirements index. The requirements index is a useful comparator in the capital planning process. Jay Klingel, long-time dean of the APPA Institute's Maintenance and Operation track, defines maintenance as "Work required to preserve or restore buildings, systems, and equipment to their original condition or to such condition that they can be effectively used for their intended purpose." Overt and implied objectives exist in this definition. Obviously, maintenance intends to preserve buildings, systems, equipment, and infrastructure for the intended use of the faculty, students, and guests of the institution. Maintenance enhances appearance, reduces noise, minimizes interruptions, and allows facilities to be fully utilized. The implied objective is that maintenance will be executed cost-effectively and result in lower operating costs. Cost-effective maintenance requires a cost-conscious, reliable, efficient maintenance organization. The people in a maintenance organization need to emphasize customer service and understand the importance of communication and coordination with customers, colleagues, and contractors. Maintenance is also expected to lower operating costs. If a sensor goes bad in an HVAC system, it can cause the chilled water valve to fully open, wasting surprising amounts of energy. The building occupants may not even notice because another sensor compensates by calling for maximum reheat. This can drive up utility expenses day after day, until a maintenance mechanic arrives to do preventive maintenance and notices the malfunction. Subtle changes can reduce both operating expenses and maintenance costs. For example, changing from standard V-belts to cogged V-belts can save energy and extend belt replacement frequency. Cogged V-belts can cost twice as much as standard belts, but the lower energy cost and maintenance savings can justify the change, especially for larger motors. An overall maintenance program combines the standard maintenance activities discussed below with each school's unique maintenance needs. Documenting the performance of legally required work, such as fire system testing. It is helpful to identify legally required work orders with a unique work type. This improves their visibility during execution and tracking. Earlier, we talked about looking for ways to shift work from the unplanned to the planned realm. Preventive maintenance is about planning work. Think about any recurring maintenance needs, especially system performance problems, and seek a way to provide planned service before unplanned corrective repair is needed. Engineers love these challenges. Turn them loose and there is the potential to reduce disruptions to building occupants and save money. The preventive maintenance software may also be used to project workloads for each maintenance department. Leveling out the workload takes this a step further and enlightens decisions about the real need for overtime or contracted resources. Predictive maintenance pursues the same objectives as preventive maintenance, but breaks the dependence on elapsed time. Predictive maintenance uses ongoing measurements, such as infrared thermography or oil analysis, to monitor equipment condition and trends, and then determine the optimal time and type of service. Predictive work may also be initiated by an event such as an approaching hurricane. Again, the goal is to decide what needs to be done in advance and then execute the work in a safe and efficient manner. Painting protects exterior surfaces and is a highly visible aesthetic factor outside and inside many buildings. Paint condition, especially exterior paint, can be monitored as part of the facility condition assessment program or as part of an ongoing paint assessment program. The assessments need to address the level of paint accumulation, caulk condition, and glazing condition. These factors guide decisions about which painting is most needed and the appropriate level of prep work. Corrective maintenance is something that maintenance program managers strive to minimize. The exception is when the decision is made not to service something and simply let it run to failure. Run-to-failure maintenance is applicable when the cost of preventive or predictive maintenance exceeds the cost of replacement and the occupant impact is minimal. Major maintenance distinguishes itself by being expensive enough to require a review and prioritization process. Projects compete against each other based on considerations such as mission impact, consequences of deferral, available funding, long-term plans for the facility impacted, and politics. Deferred projects are added to the maintenance backlog list. Capital renewal is inevitable, even for extremely well maintained buildings. A maintenance program manager needs a sense of where facilities are in their life cycle. It is wise to initiate the capital renewal process five or ten years before age significantly impacts building performance. This gives senior administrators time to consider options and plan the building's future. Once a decision is approved to fully renovate a building, it influences the maintenance approach. Guard against too much of a reduction in maintenance services. It may be years before the renovation occurs, and facilities management's goal of providing an exceptional physical environment applies even to buildings on the capital project list. Maintenance measurement provides the feedback necessary to adjust the overall maintenance plan. The FCI is an enduring and understandable metric that looks at a facility's overall health. Tracking the maintenance reinvestment rate assesses funding levels and likely long-term financial impact. The APPA Facility Performance Indicators offer many other higher level metric ideas. Select a few core metrics that make sense for your organization and commit to using them indefinitely. Complement the core metrics with measurements that come and go to meet short-term maintenance program needs. System audits are an independent way to measure maintenance program performance. They are particularly useful for critical systems such as emergency infrastructure, roofs, elevators, fire systems, and structural components of major assembly spaces. The reward is that this pursuit brings pleasure in tending beautiful buildings and grounds and helping them endure. Work management plays a major role in meeting customer needs and providing an exceptional physical environment. This only happens in collaboration with people in many other departments. They may allocate budgets, account for costs, provide information systems, procure materials, manage risks, plan for emergencies, or deliver many other services to the institutional community. Respect their responsibilities, value their input, and merge your capabilities to make work happen for your school.